The scale of the popular repudiation of Stephen Harper’s right-wing Conservative Party government in Monday’s Canadian election surprised the political establishment and the corporate media both in Canada and internationally. During a decade in office, the Conservatives slashed tens of billions of dollars from social spending, carried out sweeping attacks on democratic rights, and further integrated Canada into US imperialism’s military-strategic offensives in the Middle East and against Russia and China. The entirely undeserving beneficiaries of the popular opposition to Harper were Justin Trudeau and the Liberal Party. For most of the past century the Canadian bourgeoisie’s preferred party of government, the Liberals blazed the trail for Harper when they last held office. The Chretien-Martin Liberal government implemented the greatest social spending cuts in Canadian history, funneled tens of billions in tax cuts to big business, and initiated the revival of Canadian militarism by ordering the Canadian Armed Forces to take a leading role in Washington’s wars in Yugoslavia and Afghanistan. Little more than four years ago, the Liberal Party suffered its greatest-ever electoral defeat. Then led by Michael Ignatieff, one of the leading apologists for George W. Bush’s “war on terror,” the Liberals finished a distant third, polling less than 20 percent of the vote. Two interrelated factors account for the Liberals’ revival. First, important sections of the bourgeoisie lost confidence in Harper. This was epitomized by the call from Conrad Black, one of the patrons of Canada’ neo-conservatives, for the election of a Liberal government. There was concern that Harper had become a lightning rod for social opposition, which has grown in tandem with the collapse of the shale oil boom and the slide of Canada into recession. There was also frustration over Harper’s failure to implement key elements of the ruling class’ agenda, including his inability to obtain US support for the Keystone XL pipeline and to push through big increases in military spending in the face of popular opposition. By bringing to a power a Liberal government promising “change” and making limited appeals to popular anger over social inequality and economic insecurity, Canada’s ruling class calculates it can fashion a more effective instrument for dismantling public services, gutting social rights, and asserting its interests on the global stage. Trudeau, whose only accomplishment prior to his selection as Liberal leader was being former Liberal Prime Minister Pierre Trudeau’s first-born, is to be the front-man for a right-wing big business government. He has been tasked with using “progressive” rhetoric, modeled after the tag lines Obama employed in winning the US presidency, and a few high-profile, largely cosmetic policy changes, to repackage the ruling class agenda. The Liberals have a long history of making “progressive” appeals in election campaigns only to carry out the policy prescriptions of their avowedly right-wing opponents. Trudeau’s father secured a majority government in 1974 in the midst of a wages offensive by the working class by mocking the Progressive Conservatives’ call for a 90-day wage freeze. One year later, Trudeau announced the imposition of a three-year wage-limiting program. The second and more basic factor in the Liberals’ resurrection is the suppression of the class struggle by the trade unions and the social democratic New Democratic Party (NDP). As around the world, the ostensible organizations of the working class and the “left” in Canada have for decades functioned as instruments of big business to impose job cuts and concessions on workers and dismantle public services. In response to the greatest crisis of world capitalism since the Great Depression of the 1930s, these organizations have lurched still further to the right. The unions have enforced the anti-strike laws adopted by the Harper government and Liberal, Conservative, Parti Quebecois and NDP provincial governments. In 2012, when the Quebec student strike threatened to precipitate a broader movement of the working class against austerity, the unions intervened to shut it down. They declared they would abide by Quebec Liberal government legislation ordering them to do everything in their power to get college teachers and other union members to assist in breaking the strike. At the same time, they channeled the opposition to the Liberals’ austerity measures behind the election of a big business Parti Quebecois government. The NDP refused even nominally to support the students or criticize the Liberals’ Bill 78. The principal political expression of the efforts of the unions and the NDP to suppress the class struggle has been their longstanding campaign for a “progressive government”—that is, an alternate government of austerity and war—in which the Liberals would play a central role. The unions and the NDP have promoted the lie that the Liberals are an ally of working people in the fight against the Harper government. No matter that Harper only expanded the key right-wing initiatives of the preceding Chretien-Martin Liberal government. In December 2008, the NDP persuaded the Liberals to join them in an abortive bid to form an anti-Harper coalition government. Under the coalition pact, the NDP agreed to be junior partner in a Liberal-led coalition government committed to “fiscal responsibility,” waging war in Afghanistan through 2011, and implementing a $50 billion corporate tax cut. In 2015, the unions poured millions of dollars into “Anybody but Conservative” strategic-voting initiatives aimed at promoting the Liberals, while the NDP, including in the platform it issued just days before the election, proclaimed its readiness to ally with the Liberals in a coalition government. With the unions’ support, the NDP adopted even more explicitly right-wing policies, with the aim of convincing the ruling class that it would unreservedly uphold its interests. Under the leadership of Thomas Mulcair, himself an ex-Liberal cabinet minister, the NDP mounted a “Harper lite” election campaign, promising four years of balanced budgets, no tax increases for even the wealthiest Canadians, further tax cuts for all but the biggest corporations, and increased military spending. This opened the door for Trudeau and his Liberals to market themselves as the party of “real change.” The NDP, hoping to impress Bay Street, responded by attacking the Liberals from the right. With the authority of the unions and the NDP vastly eroded due to their complicity in the assault on the working class, various pseudo-left organizations have come forward to keep workers and youth within the orbit of these pro-capitalist organizations, arguing that they can be pressured to the left. The Canadian sister organizations of the US-based International Socialist Organization (ISO) and France’s New Anti-capitalist Party stumped for the pro-austerity NDP. While they claimed to oppose the “Anybody But Harper” campaign, they all hailed the “Stop Hudak” campaign mounted by the Ontario unions in 2013-14 and on which the unions modeled their 2015 anti-Harper initiative. The unions’ campaign before and during the 2014 Ontario provincial election against Hudak, a close Harper ally, provided the framework for the unions’ continued support for the Ontario Liberals, even as they implemented massive social spending cuts and outlawed teacher strikes. The working class will come into bitter conflict with the Trudeau Liberal government. Its agenda will not be determined by Trudeau’s saccharine phrases or the Liberals’ duplicitous “progressive” election platform, but by the deepening capitalist crisis and the intensifying geo-political conflicts to which it is giving rise. To prepare for the coming struggles, it is essential for Canadian workers to draw a political balance sheet. From Greece to the auto plants of the US, there is growing working class resistance after years of austerity and war. But it finds no organized political expression. This is because the working class is politically blocked by organizations such as the unions and the NDP, which are implacably opposed to a challenge to the capitalist profit system. They represent not the working class, but privileged layers of the upper-middle class and sections of the ruling class. To assert its basic interests, the working class must organize itself as an independent political force and fight for the mobilization of workers around the world in a common struggle against imperialist war, the financial oligarchy and the transnational corporations. This requires the building of new organizations of struggle, above all, a revolutionary party of the working class to prosecute the struggle for a workers’ government and the socialist reorganization of society. This means building the Socialist Equality Party as the Canadian section of the International Committee of the Fourth International. I was born and raised in North Dakota, a rural state with an economy that historically has been dependent on agriculture, but I knew virtually nothing about the hard work of farming—nor did I understand the way farming creates ecological crises—until I met Jim Koplin. At that time, like most people who labeled themselves as an environmentalist, I thought in terms of pollution in human communities and the need for wilderness preservation. 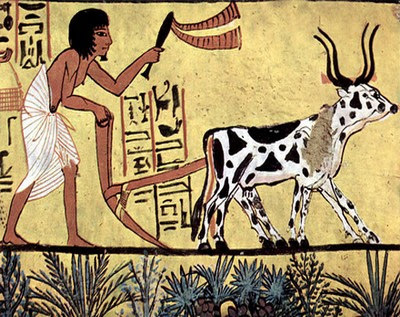 Farming was, well, just something farmers did, not an ecological question. One of the most important contributions Jim made to my education was exposing me to a critique of the increasing industrialization of agriculture, which led me to recognize that there is no solution to environmental problems without facing the problem of agriculture. That phrase—the problem of agriculture, instead of problems in agriculture—is taken from Wes Jackson, who points out that our species’ fundamental break with nature came roughly 10,000 years ago when we started farming. While gathering-hunting humans were capable of damaging a local ecosystem in limited ways, the shift to agriculture and the domestication of animals meant humans for the first time could dramatically alter ecosystems, typically with negative consequences. While there have been better and worse farming practices in history, soil erosion has been a consistent feature of agriculture, making agriculture the first step in the entrenchment of an unsustainable human economy based on extraction. political collaboration with teacher/activist Jim Koplin. Agriculture’s destructive capacity was ramped up by the industrial revolution that began in the last half of the 18th century in Great Britain, which intensified the magnitude of the human assault on ecosystems. This revolution unleashed the concentrated energy of coal (and eventually oil and natural gas) to run the new steam engine and power the machines in textile manufacturing that dramatically increased productivity. That energy eventually transformed all manufacturing, transportation, and communication, not only creating new ways of making, moving, and communicating, but also radically changing social relations. People were pushed off the land and into cities that grew rapidly, often without planning. World population soared from about 1 billion in 1800 to the current 7 billion, which was made possible by the application of those industrial processes to agriculture. Vaclav Smil estimates that 45 percent of the world’s population—more than 3 billion people—would not be here without the Haber-Bosch process, which in the early 20th century made possible the industrial production (using large amounts of natural gas) of ammonia-based fertilizers from atmospheric nitrogen, which greatly expanded food production. We are trained to think that new technologies mean progress, but the “advances” in oil/gas-based industrial agriculture have accelerated ecological destruction. Soil from large monoculture fields drenched in petrochemicals not only continues to erode but also threatens groundwater supplies and creates dead zones in bodies of water such as the Gulf of Mexico. In addition to the loss of vital topsoil, modern farming is a primary contributor to reductions in biodiversity and declines in ecosystem health. The fact that agriculture is failing takes many by surprise, given the dramatic increase in yields made possible by that industrialization of farming and the use of those fossil-fuel based fertilizers, herbicides, and pesticides. But this is what Jackson has called “the failure of success”: Production remains high while the health of the soil continues to decline dramatically, and so short-term success masks the long-term unsustainability of the system. We have less soil that is more degraded, and there are no technological substitutes for healthy soil; we are exhausting and contaminating groundwater; and contemporary agriculture is dependent on a finite fuel source. More and more people recognize these problems, which has meant more produce coming from home gardening, urban farms, and community-supported agriculture. But Jackson points out that about 70 percent of the world’s calories come from annual grains that take up about 70 percent of the world’s cultivated land. That’s why The Land Institute’s research into “natural systems agriculture” investigates ways that monoculture annual grains (primarily wheat, rice, and corn) can be replaced by perennial grains grown in polycultures (mixtures of plants that don’t require new planting every season)—farming that mimics nature instead of trying to subdue it. Jackson points out that when left alone, a natural ecosystem such as a prairie recycles materials, sponsors its own fertility, runs on contemporary sunlight, and increases biodiversity. Natural systems agriculture is one attempt to produce enough food while adding to ecological capital rather than degrading it. The industrial economy treats the world as either a mine from which we extract what we need or a landfill into which we dump our waste. While there’s no telling whether perennial polycultures are going to be the key to sustainable agriculture, it’s clear that intensifying the industrialization of agriculture is a losing bet. The modern worldview ignores the fact that everything that supports life on the planet operates in cycles. Jackson offers a powerful image of what has gone wrong: The best symbol for nature is a circle; agriculture is a human attempt to square the circle; industrial agriculture flattens the circle into a straight line on the model of a factory’s mass production. It doesn’t matter that the US overpaid $38 million for the August 9th Parliamentary masquerade; doesn’t matter the first round garnered a mere 4-5% voter participation, were heavily criticized and roundly denounced as an electoral travesty. The US-World Bank resource-mongers need a facsimile of elections to legitimize all those decrees and new “laws” they have Martelly and his un-elected Transitional Team signing without a Parliament. So, to cower the people, thinking that they can use the chaos to put in their own candidates, and to check the opportunistic politicians and control these selections, the US-Euro imperialists with the tiny Haiti billionaire oligarchs must strum up FEAR and violence this Sunday. This past weekend’s pre-election massacres of 15 to 20 people in Site Solèy by the specialized police unit called Brigade of Operation and of Departmental Intervention (BOID), is a preview. Haiti human rights activists, witnesses and radio commentators charge that the newest US-Martelly special police unit are doing the bidding of the US status quo as represented by Martelly’s political party (PHTK) and revealing itself to be in the vein of the old Duvalierist Tonton Macoutes. BOID, a 254-officer police unit formed by the Michel Martelly team in June, is charged, by activists, with the killing this last week of at least 15 to 20 people with gunfire. Four men were also reported decapitated with machetes by BOID. Their bodies found Oct 16, 2015. HLLN sources charged them with indiscriminately stopping groups of Haiti residents, in the Site Solèy and other areas, brutally throwing residents to the ground, manacling them and putting them in the back of their pick-up trucks before speeding off. The candidates in the Haiti elections know they won’t win with a clean campaign. The vote is foreign financed, the ballot system foreign made and foreign counted. Without foreign support and/or force, one cannot win. For its part, the Martelly dictatorship and un-elected transitional government is methodically stifling dissent in the prelude to the October 25th (s)election by gerrymandering areas along the coastline to add 19 new Deputy seats, increasing taxes, intimidating opposition supporters, using government funds to bribe and push their PHTK candidates, signing whatever law the World Bank and US Embassy wish them to in exchange for military protection, destroying voting centers in the populous areas where Martelly and the US are seen as repugnant tyrants using the law as a tool of repression. Just like during the Latorture Boca Raton regime days (2004 to 2006), the brutal police are jailing political opponents and killing activists as part of a broader pattern of neocolonial repression that’s especially more visible at election time. To date, among the Site Solèy residents killed by BOID were two pregnant women and a 10-year-old child. The BOID unit that is raining death and destruction upon Haiti’s poor was trained by the UN/MINUSTAH and United Nation Police (UNPOL). Formed June 2015, the foreign-trained Haiti militarized death squads are given functions that overlaps the missions of the SWAT and the National Haiti Police force (UDMO) teams, except it seems BOID is to cover more regional and departmental assignments. The overlap itself strums internal divisions, corruption and competition. Doesn’t the UN have an obligation to the people of Haiti not to unleash death squads upon them like BOID, or tolerate these human rights violation under their watch? See our past human rights actions at the Ezili Archives on the matter. For instance back in 2006 at “HLLN Letter urging UN to Protect civilians and human right workers in Gran Ravine/Martissant”; or, at this Associated Press, 2006 report “15 officers to face the bar of justice for brutal murders” or at our 2006 essay titled, “Both Lame Timanchèt and UN say their job in Haiti is to kill “bandits”: The failures of the UN and Haitian Police Chief, Mario Andresol” and the UN massacres on July 6, 2005 in Site Solèy by Èzili Dantò. HLLN has been denouncing the UN complicity with Haiti police killings and the criminal failures of the UN mercenaries in Haiti for over eleven years. Similarly, in Haiti, as elsewhere overseas, the US military industrial complex has got backup US-UN sniper riflemen miles away to shoot at Haiti policemen, the ones (like BOID) they’ve trained. This done to ramp up the chaos and to make sure these Haiti special forces shoot at the places the US-Euro plotters need them to shoot to take out an annoyance to Empire or to start the eruption of Haiti violence Empire feeds on. There are also paid Haiti criminal gangs, and out-of-uniform military and fake police, some flying in for the weekend from US cities – with rolling or multiple allegiances – used to loot the voting centers, stuff ballots, vote multiple times, intimidate opposition party members and supporters. In the US, Lee Harvey Oswald, a disposable CIA operative with no clout, was used and framed as the ultimate fall guy. It is against this background analysis we shall better understand the pre-election massacres and the violence to come this Sunday, Oct 25th, 2015. Martelly’s political organization, Mouvement Tet Kale (MTK), was the main group responsible for the election violences to counter the Preval government presidential choice, Jude Celestin, which the US did not want. MTK, rioted and vandalized Haiti’s largest cities when the Electoral Council announced Martelly did not make it to the runoff. To reward these rioters, after the US pushed to overturn the 2010 election, USAID gave the political movement backing Martelly support worth $100K. Their violent demonstrations were used by Hillary Clinton to rationalize changing the election results in favor of Martelly. On the other hand, time and time again, the people’s years of peaceful mass demonstrations to end the sexist and crude Martelly dictatorship has not persuaded the US to do the right thing. Stop empowering Duvalierist thugs and Martelly criminal activities John Kerry once decried. But they are the ones promoting illegality. Committing human rights abuses that include killing over 10,000 Haitians, making 850,000 sick with cholera, pushing sham elections, endorsing lies and turning a blind eye to the brutal deeds of their trained police units. The 20 Haitians reported killed by the BOID politicized police unit, did not benefit from the UN presence in Haiti. The blackmail opportunities here are staggering. Sealing information regarding this alleged arrest from the Haiti public, is as shocking as the U.S. cover-up of the stolen 2010 elections. Moreover, we know now (according to the Hillary emails) that the Associated Press had prior knowledge but failed to report the news that Martelly was not the winner of the 2010 Haiti elections. In the same manner today the mainstream media stays, along with the Obama Justice Department, blind, deaf and dumb about the reported US arrest of Martelly’s son. How can anyone possibly give legal credibility to these sham elections? How can there be free, fair, inclusive and transparent elections in Haiti when the 2010 US-UN interventions to delete the people’s vote and put Martelly in office is still so clear in Haitian minds but never addressed by either the Obama Administration nor UN Secretary General Ban Ki Moon? How can there be free, fair, inclusive and transparent elections in Haiti when everyone knows US aid monies fund elections to advance US interests and to protect the Haiti economic elites who are subcontractors for the transnational corporations? The election season police and death squad executions in Port-au-Prince continue the neocolonial impunity of the wealthy and powerful in Haiti. The militarized and trained Haiti police, along with the United Nation soldiers, are sanctioned to shoot Haiti demonstrators mostly with total impunity. These assaults on democracy -these internationally-run elections – are not worth the extinguishment of one single Haiti life. When I can’t sleep at night I have the bad habit of listening to world news on the radio. This seems to be a family trait that I inherited from my father. The wave of refugees trying to find safety in European countries continues unabated. The numbers are staggering. As someone from the U.S., I am shamed by our lack of response and indifference, as well as our inability to acknowledge our responsibility in unleashing the chaos and violence in the Middle East through our war making. My thoughts go to the recent perilous journey of a close Iraqi friend (I will call him Mohammed) and his son (whom I will call Omar). Already the survivor of an assassination attempt, this trusted translator, driver, guide and confidant received a death threat on his gate in early August. He fled under cover of the night, taking Omar with him. On that same day, 15 men were kidnapped in his village. He left a wife and six other children. Having lived with this dear family, I too felt as if I were on the hazardous exhausting, 42-day journey with them. From Baghdad they fled to Kurdistan. From Kurdistan they went to Turkey. Next, they boarded a boat from Turkey to a Greek island, just miles from the Turkish shore. From there they went to another Greek island, and finally to a third island. Much to their relief, they were at last able to get on a ferry to Athens. It is very difficult to describe my feelings at this moment. It is a moment I have been waiting for since such a long time, and it should make me happy. But once the ship started to go away in the Mediterranean sea far from the coast, my body became as heavy as the distance became long. Farther and farther from the dearest kids and wife, my body became heavy and tears came down. Everything has a cost in this life, and the cost of freedom is suffering. No gain without pain. One hour later I got control of myself to hide my feelings from Omar who has always kept silent since we have been far from home. He is moving his lips saying something, refusing to share his feelings. And we need to be awake for this trip, always a quick response and sometime we have to run fast. Our attempt to cross the sea failed three times in Turkey. If the Turkish police know we are Iraqi citizens they will put us in jail and send us back to Iraq. Two times we escaped from the Turkish police, but the third time they captured us on Turkish beach. We were held for only six hours and released as Syrians. It seems the Turkish side wants refugees to flee from their land because of economic problem, so the lie that we are Syrians can save our lives. But Omar refuses to tell a lie, and I spent much effort to convince him. Fortunately the police didn’t ask him since he was very tired when we were captured. I wish I could know what he is saying with his moving lips. As we stay on the deck of the ferry, I am afraid from an unexpected act from him, he might jump into the sea. So I ask the guard to let us sleep on a downstairs deck. I know that my son is a good Muslim, even better than me, and never think on suicide, but he is still under 18 years and may act strangely. Now he is sleeping in warm and dry place. From Athens they traveled to Macedonia. Then on to Serbia and then to Hungary. The messages that came were understandably brief: “Now we are on standby at the border…Hopefully we can avoid the Hungarian police.” In Hungary the border was indeed blocked by the Hungarian police and they were forced to hide in the forest. From Hungary they managed to cross to Austria. “In need your advice” Mohammed wrote me. “Which country shall I choose? Germany or Finland? The news comes from Germany that huge number of Syrian and Iraqi refugees are there and the procedures for reunion with family may be long.” I did not know what to advise him. From Austria they went on to Germany. If I register in Austria then we have to stay here. No other country will accept our case. ..Going to Germany no need for permission from Austrian government. They are happy if any refugee decides to get out from their land… Honestly I only have a little money left…As I write this, I got news that the German police have closed the border and stopped the train from carrying refugees. My idea is to stay at the border until the German authorities allow us to pass through their lands. Mohammed and Omar made it into Germany and then to Sweden. “Now we are in Sweden…we found a warm place to sleep in a basketball hall. Tomorrow we will try to buy a ticket for the ferry, but everybody says this will be impossible as they will ask for passport. But we will try.” They crossed from the Turkish shore to a Greek island in an overcrowded boat. When the Turkish Sea police chased them, everyone was told to throw their bags overboard. Mohammed’s passport was in his bag. Again and again throughout the journey he thanked me for our prayers, for imploring the guardian angels to protect them. Finally, miraculously, they crossed over to Finland. As of this writing, more than 500,000 people have crossed into Europe this year. Over 200,000 arrived in September alone, and a million or more are expected before the year’s end. Mohammed and Omar have been given housing at a children’s summer camp run by a Finnish Christian group. The nearest town is 12 kilometers away. When we arrived here, Omar was expecting to see Finish people and find friends his age. But he found himself in an isolated little village with limited food and fear from angry anti-refugee protesters who might come and invade the camp and threaten his life again…The guard told us to keep the windows closed and keep silent even if the protesters come and break the windows. He remembered the day when the gunmen in Baghdad opened fire on my car. Omar has lost many of his friends and he saw many explosions in front of his eyes. His teacher was killed in front of him, and a few days later he lost his uncle, his grandmother and his two grandfathers. Some of his friends got kidnapped. He has gotten use to life in Iraq, always keeping your sadness inside your heart. But this time his tears betray him as he tosses and turns silently on his bed at night. Today is the first happy day for Omar. There is a lake nearby us and one of the staff felt sympathy for my son and was trying to help with his psychological sickness. He gave him a fishing stick and he has started fishing. It is the first time in his life to fish, and everyone is saying he is a very lucky guy. A small fish is his favorite food. He didn’t eat fish since we left Baghdad. Yesterday he caught 8 little fish and today he got 14 little fish. This helped to solve the problem of dinner…Miriam (I will call his wife by this name) and kids are OK. Three people were kidnapped last week and Miriam says almost every day she can hear sound of machine guns. Mohammed’s nostalgia comes through in his letters. He calls Finland the “farthest country on the planet.” Far from beloved family and homeland, I worry how they will fare as the days in Finland become so short and cold. May we draw courage from Mohammed’s words and valiant journey, to embrace our own journey….where ever that might take us. Turkey is pressuring Germany to create “safe zones” inside Syria as a “price” for alleviating the EU’s refugee crisis. It’s a Faustian bargain that could escalate the Syrian conflict, where NATO forces could end up pitted against Russia’s military. German Chancellor Angela Merkel’s hot-footing to Istanbul last weekend was capped with a U-turn regarding Turkey’s much sought-after membership of the European Union. In a surprise move, Merkel announced that she was now in favor of pushing for Turkey’s accession to the EU, when only a few weeks ago she had reiterated her opposition to its membership. “Turkey holds the cards,” declared the German news outlet Deutsche Welle. And it’s hard to disagree with that, given Turkey’s pivotal role in Europe’s migrant crisis, which has seen the biggest mass movement of people since the Second World War. Some 600,000 refugees have reached EU borders this year alone, according to the International Organization for Migration. Most of the human exodus has come through Turkey, which is currently accommodating 2.5 million refugees. Most of those have stemmed from the nearly five-year conflict in Syria, on Turkey’s southern border. Turkey’s President Recep Tayyip Erdogan and his Prime Minister Ahmet Davutoglu are pressing home the opportunity presented by this crisis, by getting the EU to accept that it “needs Turkey” to halt the flow of refugees. That’s why Merkel and other high-ranking EU officials have in the last week showed a newfound attentiveness to the government in Ankara. Before she flew to meet Erdogan and Davutoglu last Sunday, the German Chancellor said that “all options were on the table.” The leaders subsequently said they had worked out an “action plan” which will be finalized over the coming weeks, with more high-level meetings planned in Berlin and Ankara. What is known is that Merkel is now backing revitalized talks over Turkey’s accession to the 28-member EU. Negotiations had been mothballed since 2005 owing to EU concerns over Turkey’s human rights record and Ankara’s repression against its minority Kurdish population. Another apparent concession from the EU confirmed by Merkel is the granting of €3 billion ($3.4 billion) in aid to Turkey for accommodating its refugee numbers – said to the largest in the world currently. Ankara claims that it has already spent $8 billion in caring for refugees on its territory. A third concession that Ankara is demanding is for the EU to back its long-held demand for setting up “safe zones” in northern Syria. Merkel demurred on the subject while holding a news conference with Davutoglu, but the Turkish premier was not holding back on the issue. “The establishment of secure zone within Syria is Turkey’s must,” said Davutoglu. “That’s why I repeated the necessity of the creation of a secure zone in Syria and keep the refugees inside their country,” he added. Turkey has been strenuously advocating the creation of a so-called safe zone in northern Syria since the war erupted in March 2011. But both Washington and its European allies have up to now balked at the idea. That’s because to maintain such a buffer territory inside Syria, which by definition means the exclusion of Syrian government forces, would require a major military intervention by the Western powers. It would, in effect, be a no-fly zone requiring American and NATO warplanes to enforce, as well as troops on the ground. But the worsening migration crisis has shifted the calculus, and appears to be giving Turkey decisive leverage. Merkel in particular is under pressure to staunch the flow of refugees. Her previous “open door policy” to asylum seekers is rebounding badly since other EU member states are refusing to share more of the burden. This week saw more anti-immigrant protests in Germany held by the right-wing Pegida movement. And it’s not just the far-right that is mobilizing. Even centrist Germans – many of them core supporters of Merkel’s Christian Democrat Union party – are growing in anxiety over the influx of refugees. One recent poll found that only one-in-three Germans back Merkel’s accommodating stance. With Hungary, Croatia and Slovenia closing their border crossings, tens of thousands of refugees are facing hellish conditions as winter approaches, and many are pushing on with desperate journeys to Austria and Germany. Media footage of migrant families freezing in muddy fields battling with riot police is putting the image of the EU in the dock of international public opinion. The crisis is becoming untenable, and Merkel is evidently compelled to do something about it. The UN refugee agency, UNHCR, reported that the number of migrants leaving Turkey for Greece and thence to wider Europe has increased in recent weeks. That suggests that the Turkish authorities may be using a tacit policy of opening refugee traffic to Europe, in the cynical knowledge that the resulting flow gives Ankara greater negotiating power with the EU. If the EU, under Merkel’s direction, accedes to Turkey’s demand for setting up safe zones in northern Syria, then that has ominous implications. 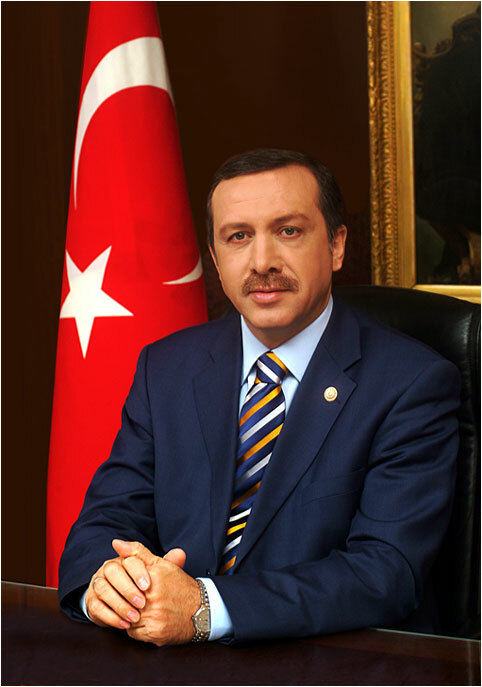 Turkey has previously called for the zones to penetrate close to the strategically important northern city of Aleppo. The safe zones would also be used as sanctuaries for “anti-government rebels.” Turkey and its Western allies refer to these rebels as the “moderate” militants of the “Free Syrian Army.” But it is an open secret that the FSA is but a fictional cover for extremist jihadists of various Al-Qaeda groups and Islamic State. The Turkish government of Erdogan and Davutoglu is believed to be a key sponsor of the extremist mercenaries in the Western covert regime-change operation in Syria. Turkey has served as a main transit route for foreign jihadists and weapons, according to Turkish opposition parties and the Syrian government. While Ankara may claim that the setting up of “safe zones” is primarily motivated by assisting civilians displaced in the conflict, it seems clear that the real agenda is to give the regime-change mercenaries cover from military assaults by the Syrian government forces. With Russian warplanes now striking hard in support of the Syrian government against the various extremist brigades, a no-fly zone established along Turkey’s border would put NATO forces in direct conflict with Russia’s military. The police slaying of musician Corey Jones in South Florida highlights one of the most reprehensible aspects of law enforcement in America -- the ubiquitous undercover cop. As yourself: What was a police officer doing driving along the highway at 3 in the morning wearing blue jeans, a T-shirt and a baseball cap in the posh neighborhood of Palm Beach Gardens? He wasn’t undercover for the purpose of infiltrating a gang. He wasn’t trying to fit into some commercial or street scene where there was a lot of suspected crime going on. He was just driving around randomly on patrol in a community known for its paucity of crime. And when he stopped at the dark entrance ramp to I-95, allegedly to check on what he claims he thought was an abandoned vehicle on the side of the road (where Jones’ van had stalled out on him and he was waiting for road assistance to arrive), this cop didn’t turn on any flashing police lights, which at least would have suggested to anyone in the van that he was a almost certainly a cop. He just walked towards the van. Now if you were someone like Jones, a lone black musician with some valuable drums and equipment in your vehicle, and you saw someone like Officer Nauman Raja approaching you in the dark, you’d be scared -- especially if Raja had his gun drawn, as he well might have, given how he was approaching the vehicle unannounced. The last thing you’d suspect would be that he was a police officer. In Jones’ case, we know he had a licensed handgun. In the US that’s not illegal. In fact, many Americans say it’s a common-sense precaution. You can agree or disagree with that argument, but it was a purely legal thing for him to do. If Officer Raja was actually on patrol hoping to “catch burglars” as claimed, he should certainly have been equipped with a car that could flash its lights alternately, if only for safety purposes. Parking on the side of a highway or on ramp late at night presents hazards simply because tired or inebriated drivers may not see the stopped vehicle and could plough into it injuring or killing both officer and driver. As well, as mentioned above, it would also allow the officer making a stop to alert the driver that he is a cop, and not a criminal. Many undercover police cars are even equipped with flashing blue lights which appear when flipped on, but which are not visible otherwise. Clearly, Raja’s vehicle either did not have those signal options, or he chose not to use them for some inexplicable reason. We can’t know what actually transpired that led to Jones’ death, because neither Raja’s undercover van nor his body were equipped with a videocam, but the fact that Jones’ body was located 80 feet from his van indicates that he was trying to flee his unidentified assailant. His gun was not fired, which is important. He may never have even drawn it or removed it from his van. The only gun fired was Raja’s and it was fired three times, reportedly hitting Jones in the side and the arm. How far away from Raja was Jones when Raja fired? We’ll have to wait to learn that. If it was at some distance, we have a clear case of murder by cop: shooting a fleeing suspect. If it was at close range, an honest exam by an honest medical examiner (sometimes a scarce commodity!) could indicate whether Jones was facing his shooter, or was turned away in some fashion. But even if Jones had been holding a gun, his killing by this undercover cop must be seen as a criminal act, not as an unfortunate misunderstanding. Had Raja identified himself clearly from the outset, with lights and the holding out of a badge, and with a call-out in a loud voice announcing his identity to anyone who might be in the van, it would not have happened. Why would Jones have fled from a cop? He wasn’t doing anything wrong. His car was broken down, he had a legal firearm he had no need to hide, he had a legally registered van and a valid drivers license. If he fled, the car belonged to him so he would have been easily located and caught and arrested later anyhow on some charge like failure to obey an officer or something. Clearly he fled because he was afraid for his life. Had he been shot once already by the time he began to run? If so, a second or third shot killed him, and that would be murder--at least in any honest and fair society -- just as it was in the North Charleston, SC cop slaying of Walter Scott earlier this year. Justice being as skewed as it is in today’s United States, it’s likely that Officer Raja will escape any serious charge, but no one could successfully argue that his victim Corey Jones should be dead today. There needs to be a national campaign to rid America of undercover cops. The whole idea reeks of police-state-ism. Sure, there can be times when an employing an undercover cop makes sense. I have a cousin who, while a police detective, worked undercover once as a “fence” to lure out a whole slew of crooks seeking to cash in on all the stuff they were burgling in his city. He let his hair grow, stopped shaving, and was playing a role. That’s a good use of undercover work. He wasn’t making arrests. He was gathering evidence on crimes and criminals. If he had made arrests, he would have clearly identified himself, ending the ruse. But he really didn’t have to. He was identifying the crooks and gathering evidence to be used against them. The crooks could be picked up later by officers in uniform, working with back-up and controlling the situation. Going undercover to crack a crime syndicate can make sense too. But driving around in unmarked cars just to look for people who might be committing minor non-violent crimes like burglary, or worse, for minor traffic violations, is reprehensible. It’s dangerous for honest citizens, it’s dangerous for cops, and it creates a sense of paranoia among the public: Am I being watched? Is that person going to attack me or rob me? When retired international tennis great James Blake was attacked in broad daylight outside his hotel in mid-town Manhattan last month by an undercover cop, part of a team of cops investigating an alleged credit card fraud, he was damned lucky he wasn’t killed. The officer, James Frascatore, never identified himself. He just attacked Blake. Only after Frascatore had slammed his victim face-first onto the sidewalk and climbed atop him, yanking his arms violently behind him to cuff him, did Blake realize he had been assaulted by a cop. Had he been more successful in resisting, the incident could have easily ended not with the Frascatore getting in trouble, but with Blake being shot to death like Jones or strangled by a choke hold like Eric Garner. And we’re talking about an unarmed man suspected (wrongly) of being a credit card fraudster, not a violent criminal. Enough! No more undercover cops on patrol, or just trolling for busts. No more Corey Joneses! A recent sequence of events reveals what happens when U.S. media depart from the pro-Israel narrative. 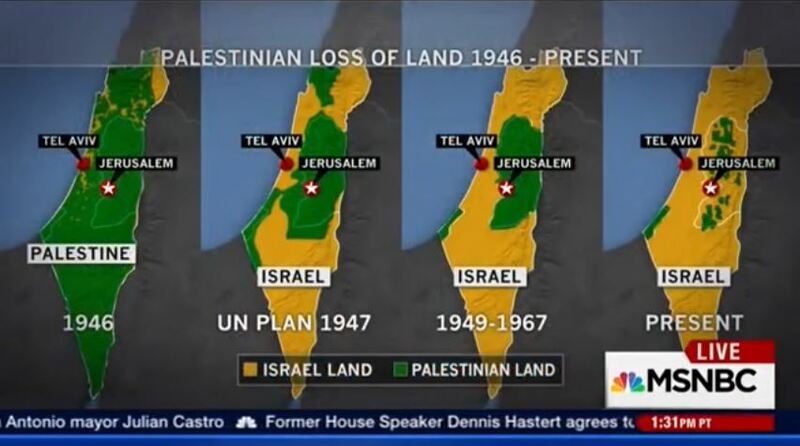 Following an unusually honest report on Israel-Palestine, MSNBC Live backpedaled to Israeli talking points that were both illogical and uninformed. Let us look at what happened. There was an immediate onslaught against the show by Israelis and Israel partisans, including Israeli media and such pro-Israel organizations as “Honest Reporting” and Mediate. (1) First, he claims that the first map was “inaccurate” because it was labeled Palestine, and Palestine was not a state. While this is a standard Israeli talking point, it is illogical and irrelevant. To demonstrate this point, let us examine a hypothetical parallel. A map of Puerto Rico, for example, would not be “factually inaccurate” because Puerto Rico is not an independent state recognized by the Western political system. (2) Fletcher’s second point is similarly irrelevant, because he mixes apples and oranges. The maps are clearly labeled “Palestinian loss of land.” Claiming that the maps were “factually inaccurate” because they didn’t cover a different topic –demographics – is a little like complaining that a map of climate zones is inaccurate because it doesn’t depict geologic zones. In actuality, the maps correctly depict, as the title makes clear, expropriation of Palestinian land. In the late 1800s, Arab Muslims and Christians lived on about 99 percent of the land of Palestine. The Jewish population, mostly Arab too, was a largely urban population and owned about 1 percent of the land. There were intense efforts to acquire land by any means, and by 1946 Jewish ownership in Palestine was, at most, 8 percent of the land; most historians put it at about 5-6 percent. This 1946 land ownership is accurately depicted in the first map in the series. The maps accurately reflect this land dispossession. They do not claim to discuss a different aspect of this history, population percentage. However, if Fletcher wishes a sequence of maps depicting this different subject – population change in Palestine – these could be provided and would be similarly revealing. The first map would show that at the time the world Zionist Organization decided to create a Jewish state in Palestine, 1897, the Jewish population in Palestine was about 4 percent. The plan was to push out the 96 percent of the population that was not Jewish (mostly Muslim and Christian), either though financial dispossession or violent expulsion, and replace it with massive Jewish colonization and immigration. The next map would show that, 50 years later, this strategy had swelled the 4 percent Jewish population to 30 percent. A third map, for 1949, would contain for the first time a state called Israel. This new state would be on 78 percent of the land and contain a population that was over 85 percent Jewish following Israel’s founding war, when Zionist/Israeli forces ethnically cleansed between 750,000 and one million indigenous Palestinian Muslims and Christians. (3) Fletcher’s statement about the nature of the conflict also contains erroneous claims. Fletcher’s assertion that Muslims believe “God gave them the land” is bizarre; I’ve never seen this claim before. While Jerusalem is profoundly holy to Palestinian Muslims (and Christians), Palestinians’ land claims are rooted in the same very basic concept held by people around the world: that they owned and lived on the land. Fletcher’s statement that Jews believe God gave them the land is more accurate, though he fails to note that there are some religious Jews who believe that the ancient Israelites’ violations of this covenant caused God to disperse them; they consider the Zionist movement extremely heretical. In fact, history indicates this was the prevailing view among observant Jews when the political Zionist movement began. (4) Fletcher’s suggestion that this is a conflict between “two peoples… “Jews and Muslims,” is also inaccurate. First of all, it omits the fact that many Palestinians are Christian and that Christians have had a significant presence in the land ever since Christianity was born there and many Palestinians’ ancestors became followers of Jesus of Nazareth. Second, Fletcher’s statement ignores the many Jewish groups and individuals who do not support Zionism. Third, it suggests a religious interpretation for a conflict that was created by a secular political movement and land theft. The map of 1947 uses the term “Israel” for the 55 percent of Palestine that the UN General Assembly, under political pressure, recommended be given to a Jewish state. In reality, Israel did not yet exist and was not created until 1948. The first maps appear to include the Golan Heights under the Israel label, when in fact this was Syrian land. Israel conquered this land in 1967 and illegally annexed it in 1981. Appropriation of land through force is illegal under international law and the international community does not recognize Israeli sovereignty there. It’s unclear when and why Fletcher decided to make his follow-up retraction, and it’s interesting to ponder what his full thoughts might be. It may be relevant that he only discusses the first map in the sequence of four. Fletcher, who also works for PBS, has been covering this issue for at least 40 years, has written a book about Israel, and is considered an expert on it. Fletcher’s wife and children are Israeli, he is Jewish himself, and he has said that he “loves” Israel. His book “Walking Israel,” won the National Jewish Book Award. Despite these potential obstacles to full objectivity, Fletcher’s first, unscripted response upon seeing the maps (which he had clearly not viewed before) is accurate and fair, to his credit. Without any hesitation he acknowledged that they correctly depicted the nature of the conflict: a conflict over land in which one party is truly being wiped off the map. Despite his subsequent quibbling, that is a powerful statement about the reality of what has been done—and continues to be done—to Palestinians. The Israel lobby may pervade U.S. news media and dominate what it may say, but the real facts about Palestine are increasingly leaking out to Americans. And that is what most scares those who wish Israeli power over Palestinians, which is only possible through U.S. support, to continue. Can BP Finally Trigger The Chinese Shale Boom? Chinese President Xi Jingping wrapped up a productive week in the United Kingdom this week, inking major deals that tie the two countries closer together. The trip made more news than Xi’s visit to the U.S. a few weeks earlier, where he wasn’t treated with nearly as much deference. The red carpet rollout produced a series of major trade deals, but one of the most important developments of the trip was an announcement of deeper cooperation between BP (NYSE: BP) and China’s state-owned China National Petroleum Corp (CNPC). The agreement called for strategic cooperation in “shale gas exploration and production in the Sichuan Basin and future fuel retailing ventures in China and other international partnerships.” British Prime Minister and China’s Xi Jingping were on hand for the signing, a deal that will form the backbone of a “global comprehensive strategic partnership” between the two countries in the 21st century. BP and CNPC already cooperate on a crucial oil project in Iraq. The Rumaila field, Iraq’s largest, produces 1.3 million barrels per day (mb/d). The successful cooperation between the two oil companies in Iraq convinced them that they should expand their partnership, BP’s CEO Bob Dudley said in a statement. In addition to the shale partnership, BP also secured a deal to supply state-owned China Huadian Corp. with 1 million tonnes of LNG per year for the next two decades, a deal that the company says is worth $10 billion. But the real excitement is over China’s shale sector. 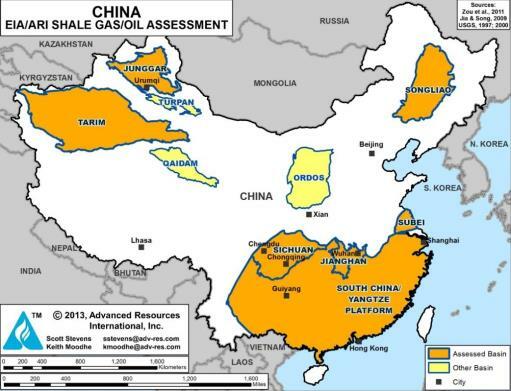 China holds the largest reserves of shale gas in the world at 1,115 trillion cubic feet. It also holds 32 billion barrels of oil trapped in shale, putting it behind only Russia and the U.S. In other words, the shale potential is truly massive. The southwest section of the Sichuan has a good combination of attractive below and above ground features: favorable geology, flat surfaces, existing pipelines, water availability, and proximity and access to urban gas markets. If shale is going to be developed in China, it will be here. There are other shale basins that have potential, but are much less attractive. For example, the Yangtze Platform is structurally much more complex than the Sichuan. The shales do not hold continuous deposits, and data is sparse. Chevron (NYSE: CVX) and BP have looked at the area in years past when prices were high, but it is not the top priority for the industry. Then there is the Jianghan Basin to the east of Sichuan. Jianghan is home to some conventional drilling, but its geological complexity also makes shale development less appealing relative to the Sichuan. With this context in mind, BP’s partnership with CNPC to target the Sichuan makes sense, and holds out the potential for future success in both oil and gas development. Despite the potential of the Sichuan Basin, international companies trying to tap China’s shale resources have been frustrated by a litany of obstacles. The geology is complex. Infrastructure is lacking. Water resources are scarce. Data needed to find and develop the best resources is also scarce. Put more simply, China’s shale remains underdeveloped, which makes production costs a lot higher compared to North American shale. The government also regulates prices, which complicates the return on investment. China has seen more than 200 wells drilled thus far, and China’s state-owned companies, including CNPC and PetroChina, are expected to produce 600 million cubic feet per day (MMcf/d) of shale gas by the end of the year. CNPC has done the bulk of the work, accounting for 125 wells drilled (74 of which have gone into production) and could produce 250 MMcf/d by the end of 2015. Still, this is a paltry sum – the U.S. produces a few orders of magnitude more than this from its shale basins. The Marcellus Shale, for example, produces nearly 16,000 MMcf/d. The collapse in oil prices has forced the oil majors to prioritize. Since there is not enough money to throw around the way there was a few years ago, high-cost areas are getting cut from exploration portfolios. And despite BP’s deal with CNPC, the oil majors have sent mixed signals on their dealings in China. For example, in 2014 BP pulled out of joint ventures in the South China Sea, writing off $112 million. The British oil giant is probably pleased with that move, considering the simmering tension in the region. 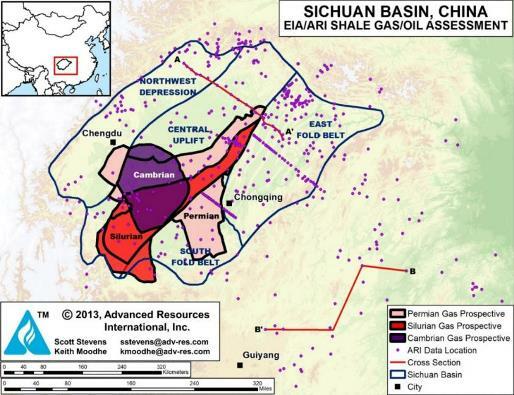 But shale regions in China are also on the chopping block. Royal Dutch Shell (NYSE: RDS.A) signed a production-sharing contract with another Chinese state-owned giant, PetroChina, in 2012. But earlier this year, Shell reduced its exposure to China’s shale industry, and also sold a 75 percent stake in an oil-lubricants business based in China. It also pulled out of an LNG export project in Australia with PetroChina. Other companies followed in Shell’s footsteps. Anadarko Petroleum (NYSE: APC) and Noble Energy (NYSE: NBL) sold off their Chinese assets. Hess (NYSE: HES) scrapped a venture with PetroChina in China’s shale patch. Another Chinese oil giant, CNOOC, scrapped a shale gas project in Anhui province earlier this year because of high costs and disappointing results. All of this makes the announcement between BP and CNPC a curious one. Low oil prices will likely prevent any significant investment in Chinese shale in the near-term. China’s shale patch is simply too expensive right now. That will change once the industry starts to scale up, but for now, that remains a little ways off. The above ground factors are also not insignificant. Roads, rigs, pipelines, processing facilities, deep capital markets, friendly regulation, mineral rights, risk incentives – these are all essential ingredients necessary for a shale boom, elements that are uniquely abundant in the United States but are largely in short supply in China. This will change for the better when oil prices rise. But for the latest BP-CNPC announcement, investors should remain skeptical until actual dollars are committed to an exploration program. For now, the partnership could remain on paper. A Kurdish-led left political party is under siege by rightwing nationalists and the terrorist organization, the Islamic Front. First, there are the President’s increasingly authoritarian strategy.